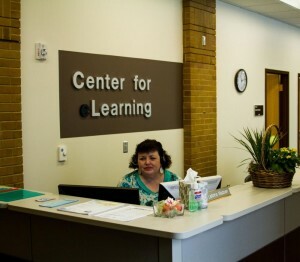 Salt Lake Community College’s eLearning and Instructional Support Office provides support and resources to students who take online classes, and to the instructors who teach them. Online courses are offered as an alternative for students who can’t fit face-to-face courses into their schedule. Heidi Manwell, the administrative assistant for eLearning at SLCC wants students to understand the program better so that they can have a good experience. According to Manwell, online classes can be a great option for students who have a busy schedule, but online classes are not always the best option. Online classes require more self-discipline than face-to-face classes because students don’t have a set time to work on their class work. The eLearning Taskforce is currently working to create a five-year eLearning plan and has created work groups that are addressing several key issues. Possible solutions that the work groups are discussing include an online orientation to help prepare students for online classes. This will help students to make a better decision on what type of class is the best fit for them, whether it is completely online, a hybrid course that has some online and some face-to-face instruction or a fully face-to-face course where a student must be in class. To improve course consistency, the group has discussed using a course template that provides a basic structure while they input the content to ensure that all online courses have a similar basic flow of information and the same basic navigation. The group is also working on making the information about their services more available to instructors who may be struggling with creating an online course and who do not know about all the services available to them to help them create courses for online instruction. The eLearning and Instructional Support Office provides support for instructors who teach online. The eLearning office is home to instructional designers, project managers and instructional technologists who can consult with instructors to create online courses that are engaging and fulfill the requirements for the course, while allowing the instructor to control the course content. Instructors may not be aware of the resources available through the eLearning center. SLCC is moving toward using a single Learning Management System (LMS) for all of its online courses, but the college does not currently have any policy that requires instructors to use a particular format or platform for online courses. Canvas is the main LMS used on campus, but some instructors use other platforms such as Assessment and Learning in Knowledge Spaces (ALEKS), which is often used to teach online math courses. The eLearning office is open from 8 a.m. until 8 p.m. Monday through Thursday, and from 8 a.m. until 6 p.m. on Fridays. They are also open on Saturdays from 9 a.m. until 1 p.m. Students can contact the help desk through online chat, by email elearningsupport@slcc.edu, or by telephone at 801-957-4406. They can even stop by the eLearning office at the Taylorsville Redwood Campus in TB 213.